Due to damage to overhead cables on Friday, the West Coast line was disrupted on Saturday. When I arrived at Euston, the train that I had been aiming to catch had already been cancelled. At that point I decided to take the Met line to Watford. As it happened, that meant that I arrived in Watford later than I would have done otherwise, but I did bump into Johnno at Euston Square and gave him the benefit of my travel advice (don’t take the same route as me). There was a good crowd in the West Herts and the company was made all the more delightful by a good contingent of Norfolk ‘Orns. A couple of our number had already paid a visit to the Hornet Shop to buy their copies of GT’s autobiography. I suspect that Kleenex profits will go through the roof as Watford fans read the great man’s words (as interpreted by lovely Lionel Birnie). On the way down Occupation Road, I bumped into Miles Jacobson, who was taking a break from the Directors’ Box to take his season ticket seat in the SEJ stand. While we were chatting, I was a little distracted as first Britos and then Chalobah walked past us. Once inside the ground I had a diversion on the way to my seat as Don had left the West Herts before our resident sweetie man arrived so I was sent to deliver his bag of half-time sweets. I was hoping, but not expecting, that he would not need something to cheer him up after the first half. Team news was that Silva had made two changes from midweek. One enforced as Pereyra came in for the injured Hughes, the other was Deeney in for Gray. So the starting line-up was Gomes; Mariappa, Prödl, Kabasele; Femenía, Cleverley, Doucouré, Zeegelaar; Pereyra, Richarlison; Deeney. 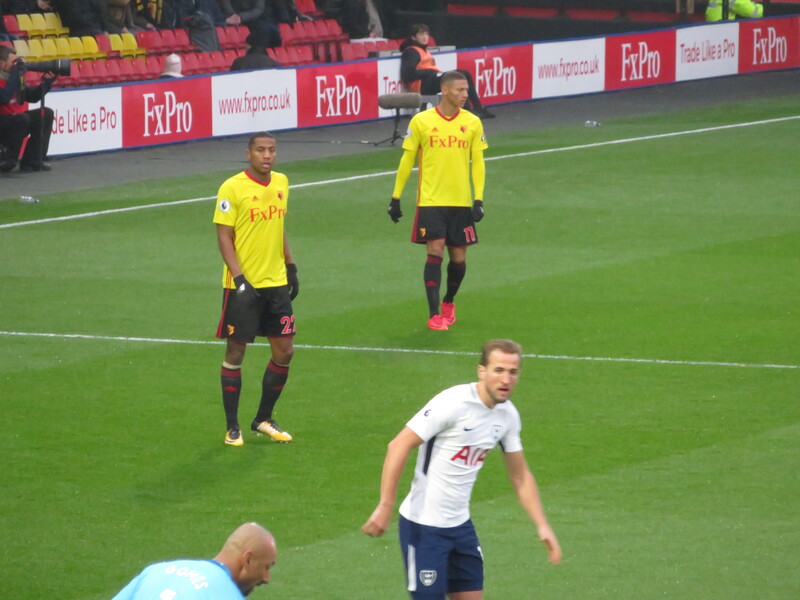 Spurs had the first chance of the game as Trippier delivered a dangerous cross into the Watford box, but a tackle on Kane stopped the shot and caused the Spurs man some pain. He was off the pitch, but the referee was clearly very worried about his welfare and waited with him until he was fit to continue. I must admit that I have never seen such concern shown for an injured Watford player. A cross-field ball from Cleverley looked as though it was going out, but Richarlison did brilliantly to keep it in play. He advanced towards goal and I was disappointed that he didn’t try a shot, instead playing for the corner. What do I know? His decision payed dividends as the delivery from Cleverley was headed home by Kabasele. Watford had a chance to increase their lead as a ball came in to Richarlison who tried an overhead kick that was blocked. Another chance for the Hornets but, from the other end of the stadium, all I could see was a number of Watford bodies in front of Lloris trying to bundle the ball in, so missed Richarlison being knocked over and the shouts for a penalty from the Family Stand, which were ignored by the referee. Spurs broke down the other end and Eriksen crossed for Son who had an easy tap in for the equaliser. The first caution went to Cleverley for a foul on Alli. 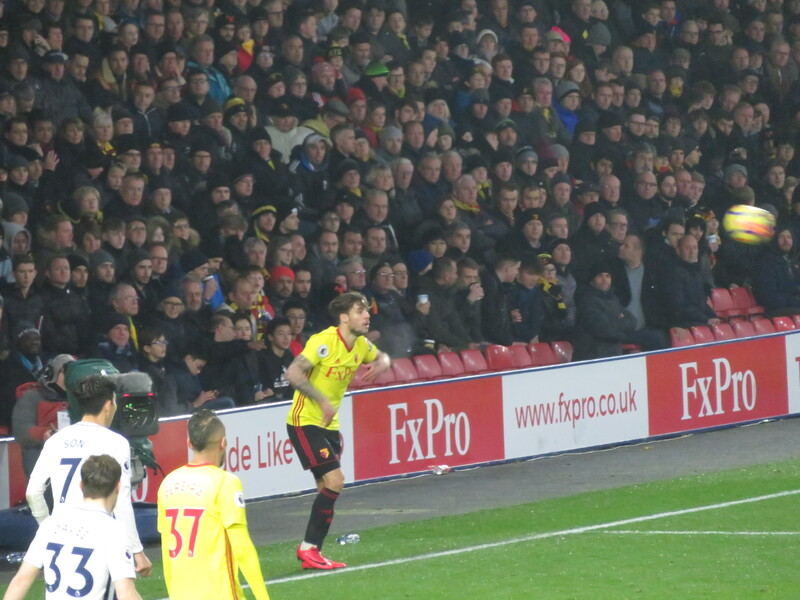 There were then chances for both sides, first a free kick from Eriksen that was easily gathered by Gomes, then a much better chance for Watford with a fierce shot from distance from Doucouré that flew just wide of the far post. The visitors had another chance as a clearance from Deeney fell to Davies on the edge of the box, from where he fired wide of the target. My heart was in my mouth when Spurs won a free kick in time added on after Prödl fouled Alli. A voice behind me suggested that it would be directed over the wall. Thankfully, he was correct as Kane’s delivery flew well over both the wall and the crossbar, so we went into half time with the scores level. It had been a decent first half. Spurs had dominated the possession, but a draw was probably about right at this stage. There was also a decent half-time penalty shoot-out with St Bernadette’s thrashing St Theresa’s with some gorgeous spot kicks. The first notable incidents of the second half both involved the referee’s cards. First Kabasele was booked for a tactical foul on Kane. Then Davinson Sánchez threw his elbow into Richarlison’s throat just in front of the fourth official. It was a nasty foul and there was no surprise when a red card was shown, although some of the Spurs players thought that it was worth protesting. With almost 40 minutes left to play, this was looking very positive for Watford and they should have regained the lead when Zeegelaar put in a lovely cross which was met by the head of Richarlison, but he couldn’t direct the header towards the goal. A poor corner from Cleverley found its way to Doucouré who unleashed a brilliant shot that hit the inside of the post and rebounded across the goal but, sadly, away from the target. Each side made a change on 64 minutes with Capoue coming on for Kabasele for the Hornets (to ensure the Belgian didn’t get a second card) and Sissoko on for Eriksen for the visitors. 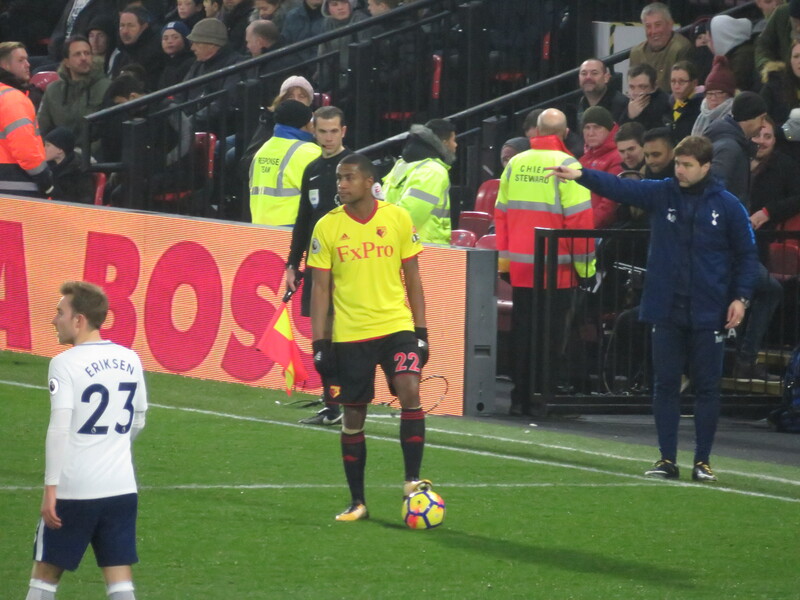 The second Watford substitution came soon after as Pereyra made way for Carrillo. There was some concern with 20 minutes to go as Gomes was injured making a save. He looked in considerable pain but, thankfully, was fit to continue after treatment. Yellow cards for each side followed with Vertonghen penalised for a foul on Capoue and Zeegelaar for pulling down Alli. Watford should have taken the lead as a cross from Carrillo was met by the head of Richarlison, but the ball nicked off a Spurs head and flew out for a corner that came to nothing. The second substitution for Spurs saw Lamela on for Son. Capoue then tried a shot from distance, but it was straight at Lloris. There was a final substitution for each side with Winks replacing Alli for the visitors and Gray on for Cleverley for the home side. 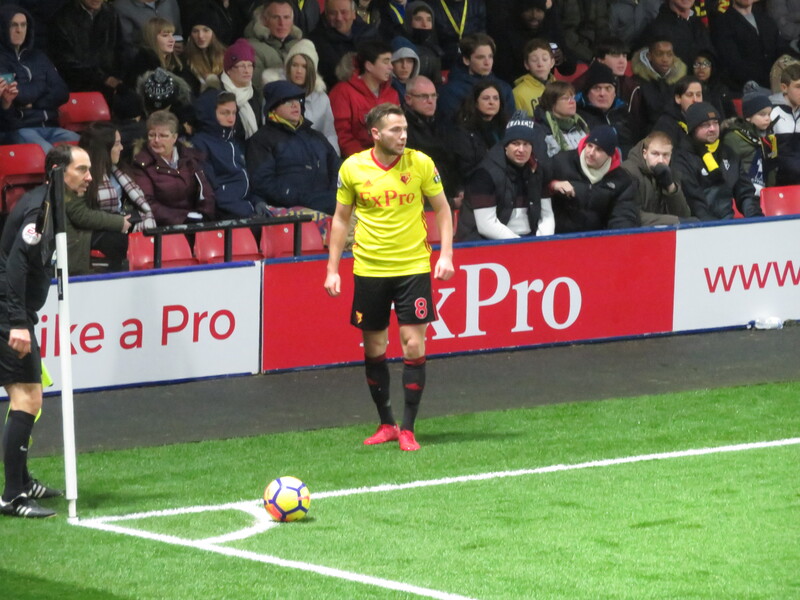 The latter change had caused some confusion as Deeney had spotted Gray ready to come on and had handed the captain’s armband to Cleverley before he started walking to the touchline. He was sent back and Tom returned the armband as he went off. 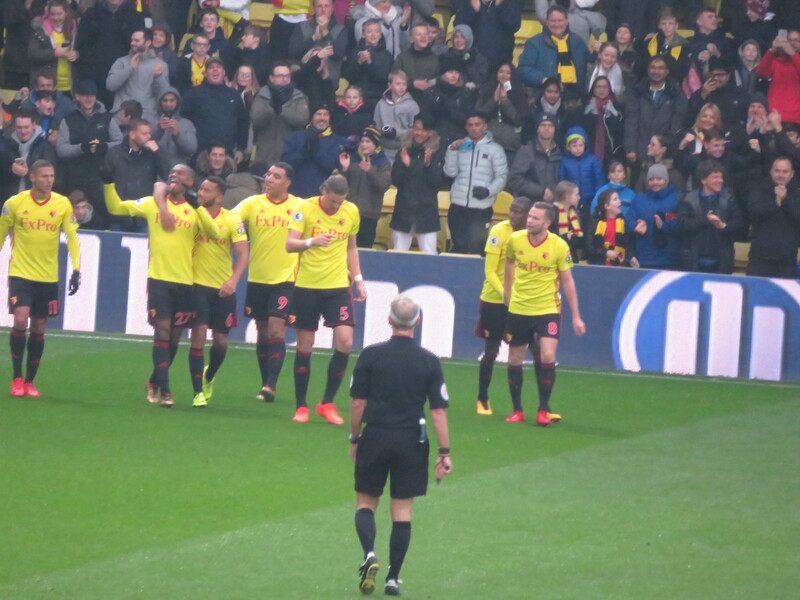 Carrillo had a moment that summed up his afternoon as he brilliantly won a tackle to advance and then put in a dreadful cross that was easy for Lloris when there were three Watford men in the box to aim at. In the last minute of time added on, a cross from Richarlison was clearly handled by Dier, but the claims for a penalty by the players and those in the Rookery, who had a perfect view, were waved away. At the final whistle there were boos, but they were directed towards the referee rather than the team. The post-match interactions between the opposition players, though, were very cordial. 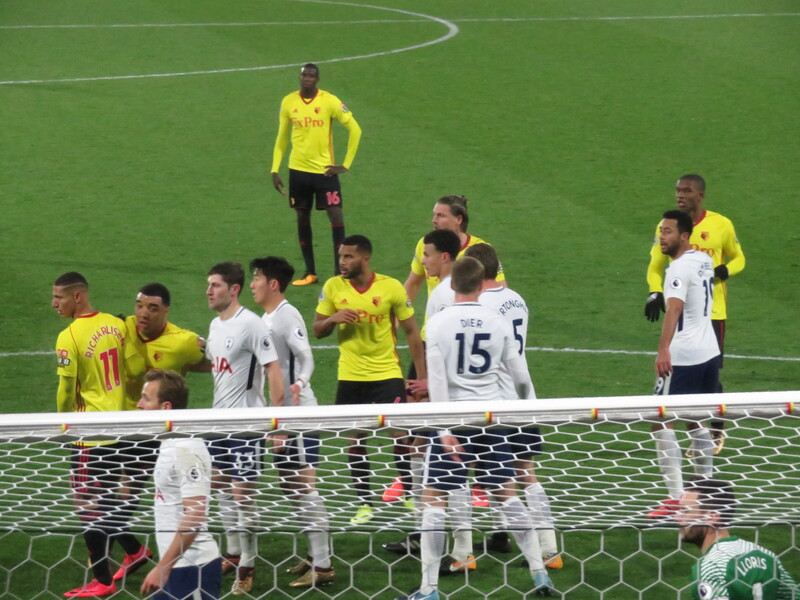 Trippier was being hugged by every Watford player and I don’t think I have ever seen so many warm hugs exchanged between opponents, but maybe I have not been paying attention. This entry was posted in Watford FC and tagged Abdoulaye Doucoure, Adrian Mariappa, Andre Carrillo, Andre Gray, Ben Davies, Christian Erikson, Christian Kabasele, Davinson Sanchez, Dele Alli, Eric Dier, Erik Lamela, Etienne Capoue, Harry Kane, Harry Winks, Heurelho Gomes, Hugo Lloris, Jan Vertonghen, Kieran Trippier, Kiko Femenia, Marco Silva, Marvin Zeegelaar, Mauricio Pochettino, Mousa Dembele, Moussa Sissoko, Richarlison, Roberto Pereyra, Sebastian Prodl, Son Heung-min, Tom Cleverley, Tottenham Hotspur FC, Troy Deeney, Watford FC on December 3, 2017 by franelynn.